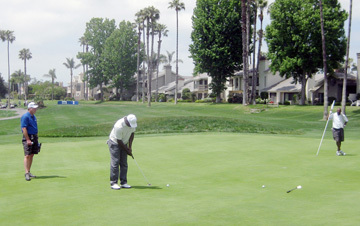 NFL Hall of Fame running back Marshall Faulk putts for a birdie on the 18th hole at Morgan Run in the Cox Celebrity Championship. 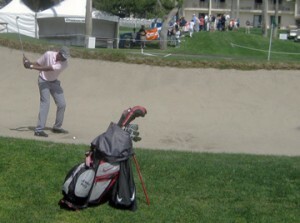 Jerry Rice practices sand shots before his opening round. — Actor Jack Wagner, the event’s defending champion, knows how Stenerud feels. Wagner was seen at the course but not on the course. Seems he tweaked something in his back and was forced to miss the first day of play. Sounds like he may need a trip to General Hospital for further examination. Joe Morgan and Rick Rhoden visit on the practice green. 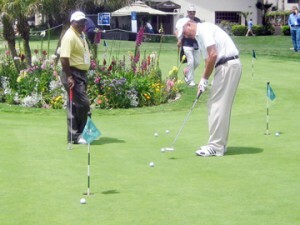 — Hall of Fame second baseman Joe Morgan wasn’t having much luck finding the bottom of the cup on the putting green when former pitcher Rick Rhoden, a four-time champion in this event and runner-up last year, walked up and provided a welcome distraction. Morgan greeted Rhoden with a big grin and some small talk, then watched with envy as Rhoden stroked putt after putt into the hole. This entry was posted in Attractions, Golf & Sports, San Diego Events and tagged Andre Reed, Cox Celebrity Championship, golf, Jack Wagner, Jan Stenerud, Jerry Rice, Joe Morgan, Marshall Faulk, Morgan Run Resort and Club, Rick Rhoden, Rolf Benirschke by Kirk. Bookmark the permalink.